I made this Apron when I went to India for vacation.I have my babe(My sewing machine) in my home.As it has been many days since I used it , I planned to use it when I went there for vacation .So, I took a old shirt of my hubby with me to make this Apron.There are different ways how you can make a apron from men's shirt.The shirt which I used has worn out collar so I used this method to make a apron.Now lets move on to the making. Step 1: Mark the areas you want to cut for the main portion of the apron. 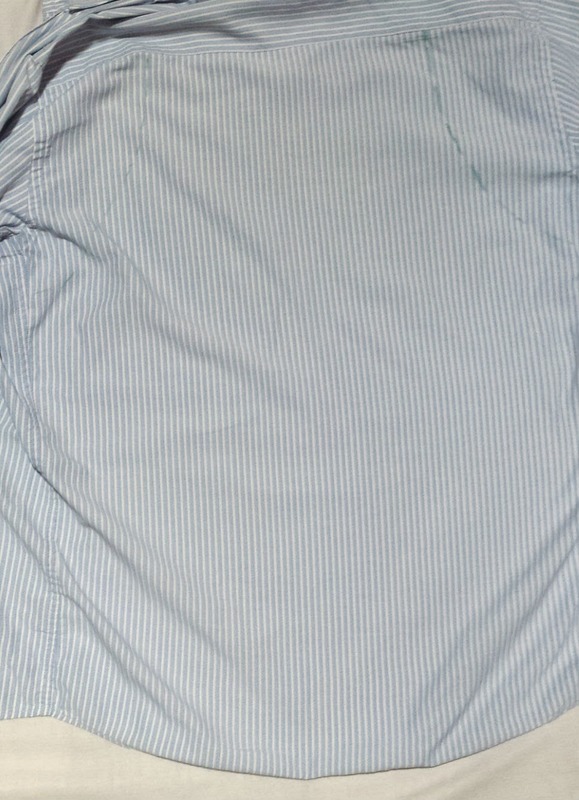 I used the back portion of the shirt for apron.Draw two curves on either side near the armhole area.Cut the fabric leaving some extra inches on all the sides to fold and stitch or to fold and glue. 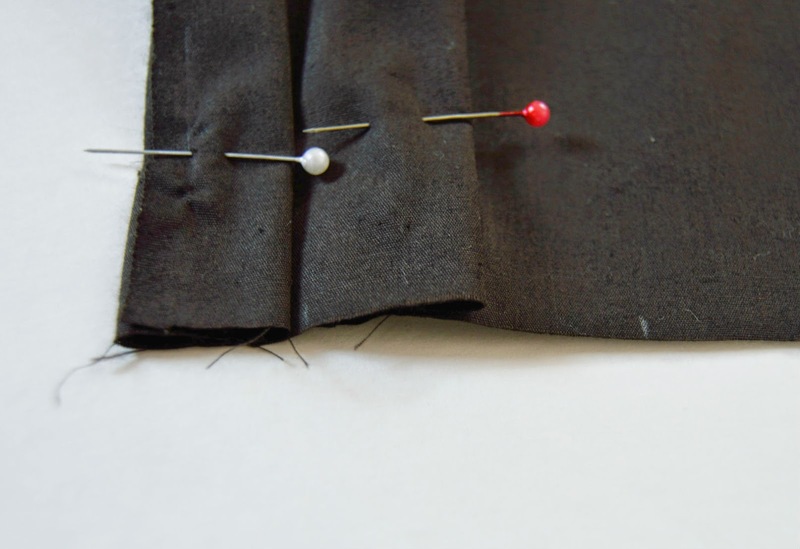 Finish the sides by folding the edges inwards and making a stitch. Cut some strips of fabric from sleeve area or the front portion with the width of 2 inch and make a long rope (Attach the pieces together to make it long) for the neck and for tying the apron in the back.To make this, fold the strips half an inch inward on both the sides and fold it again and stitch. 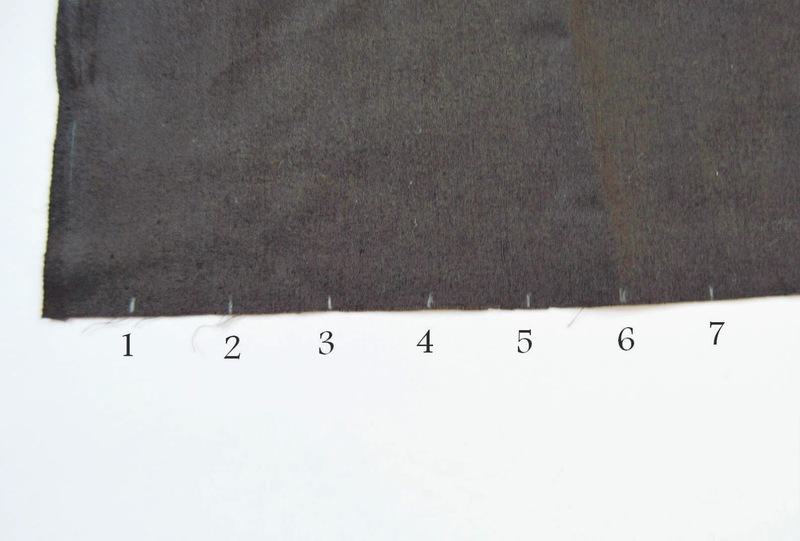 For the armhole area(I mean the curves),Cut an 2 inch width of fabric from the sleeve area to cover the edges of the armhole area and top of the apron.Use these strips as a binding strips.You can also get a binding strip which are readily available in the store.Make a half inch fold on both the sides and iron(Picture 1).Cover the edges with the strips(Picture 2) and make a stitch. 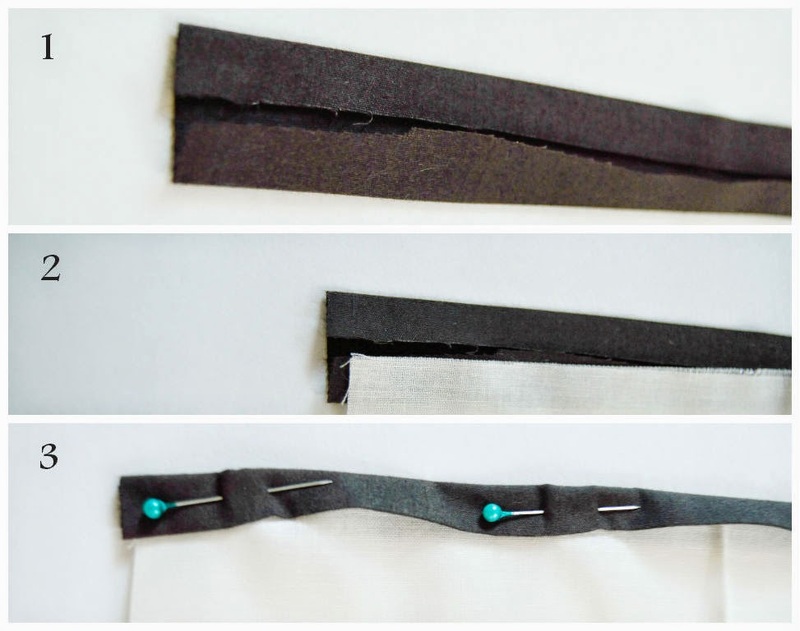 If you are using fabric glue ,you can still do the same step with the glue instead of stitch. This is a optional step.I felt adding a detail with contrasting would be interesting.So, I decided to add a pleated trim to the top portion of the apron.If you want to add a pleated trim, you need thrice the length of fabric to the area, you want to cover with the trim and width can be according to your choice.I measured 2.5 inch width for my pleated trim. For example : The top portion of apron measures 11" and so I took the fabric for 33" length to cover that 11" portion with the pleated trim. It is always good to measure some inches extra for safer side. :)Before making the pleats fold and stitch the hem portion of the trim. Mark 1 inch width with the marker covering the whole length.To make it easier for you, I have numbered the markings as 1,2,3 and so on.To make one pleat , you need 3 widths.Pinch the fabric in marking 1 and join it with the marking 3 so that it forms a reverse "S" shape.Repeat the same step with next 3 widths (4,5,6) to form the next pleat.Secure it with pins and stitch. Attach the trim to the top portion and cover it with the binding strips. 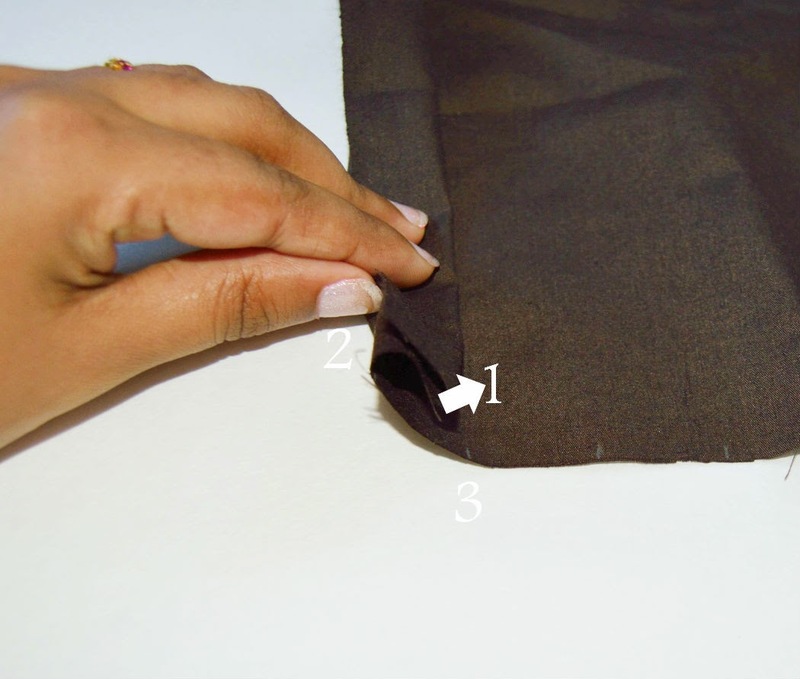 Measure the neck portion and cut the long rope(Which you already made in step 3) to suit your length.Attach them to the corners of the top portion.If you are sewing ,make sure you use two to three zigzag or reverse stitches to secure it. Measure the long rope and cut them into two equal length so that it can be attached to each side of the apron .Attach the rope where the side seam and armhole area meets on each side.This rope is used to tie a knot at the back to secure the apron.Voila! !you are almost done!! Cut a piece for a pocket and fold the edges and stitch it to the center bottom of the apron.Again this is a optional step.I used the area with buttons in the front portion of the shirt for pocket .Thats it !!! 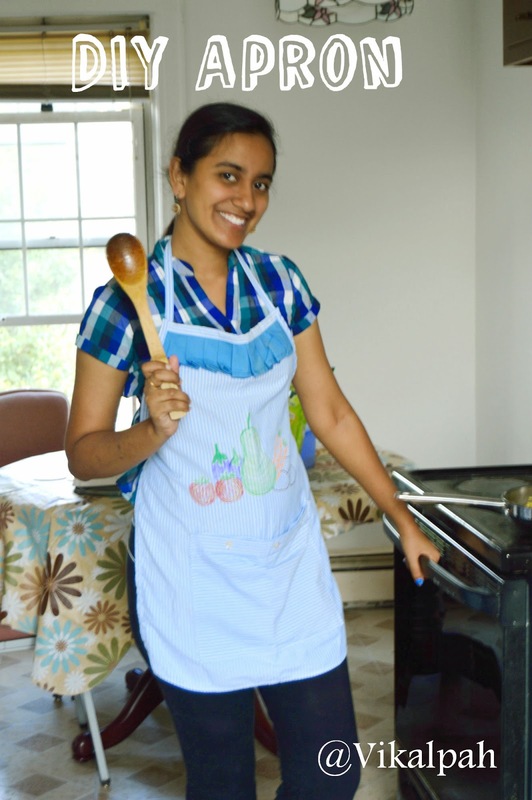 Now you are all set to rock your kitchen with your newly stitched apron. I added some vegetables with the fabric markers as I felt the area was too empty. I have used a different fabric to show you the process as I did not take camera with me and also there was no good light inside my house to capture it with my mobile.So forgive me for that.Please feel free to ask any doubts in the process of making this apron. So what do you think about turning men's shirt into apron?? Have you done any "This to That" kind of projects before?? Share them in the comments below. That is SO cute!!! Every time I come to your blog I'm always amazed at your creativity! I love using old clothes and turning them into something new! I have a huge box of clothes just waiting for me. I think I'll make some aprons for my kids' art time. Great idea and tutorial! Sweet. The vegetables add a great touch. wow awesome! I love the style of apron and the embroidery! 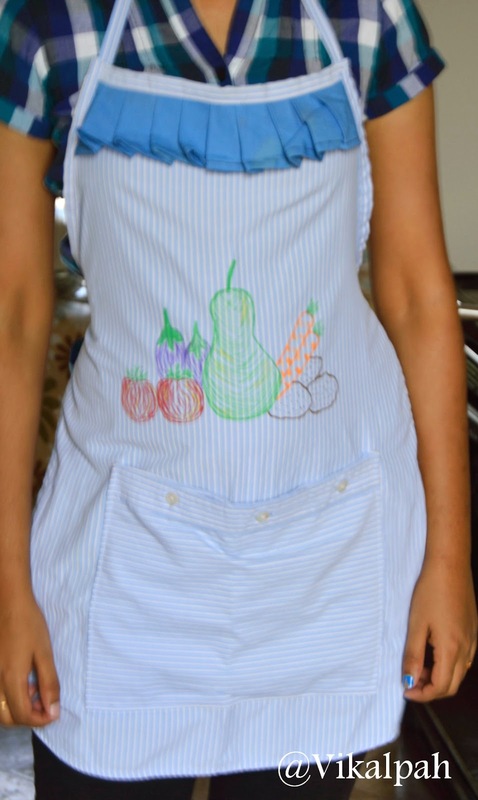 You would never guess this apron is from an man's shirt! Thanks for inspiring us at the creative craft challenge!